Butcher, a trout and salmon fly invented by G.S. Jewhurst of Tunbridge, Kent. Fly tied by Mark Kirchner. FROM THE NORTH-COUNTRY streams of England came the most lasting landmarks in the development of the fly fishing. The idylls of Walton and the technical prowess of Ronalds and Stewart originated north of London, but it was the streams south of the city, the Test and the Itchen, that would be the settings of the most controversial developments the sport has ever seen — indeed, a controversy that would carry right to our own fishing today. The birth of this controversy coincided innocently enough with the emergence (ahem!) of the dry fly under the divine leadership of one Frederick Halford and culminated and matured with the development of the artificial nymph under the sponsorship of G.E.M. Skues. Both men added to our literary history with writings on their opposing positions. Frederick Maurice Halford was the first genuine dry-fly snob. In fact, he gave the character type its definitions. Between Floating Flies and How to Dress Them, published in 1886, and The Dry-Fly Mans Handbook, published in 1913, Halford developed from a progressive theorist with a better idea to a dogmatic pedant who believed anyone who fished differently than he shouldn’t be allowed near moving water, let alone fish for trout. He brought the art of dry-fly fishing to a high art, then drew a line in the dirt. Of course, whenever any man draws a line in the dirt, another is certain to come along and step across it, whether as an act of defiance or because that line happens to lie across the other man’s path. Such a second man was George Edward MacKenzie Skues. Skues’ writing was thoroughly grounded in fly dressing, and his game was the sunken fly, or nymph. The two schools, Halford and Skues, and the wealth of literature and angling expertise their ideas spawned, provided one of the lasting and constant conflicts even in the ranks of American anglers today. There’s scarcely a fisherman who won’t side with one or the other at any given time over the superiority of the floating versus the sunken fly. The ongoing philosophical conflict forms an ideological core within the sport. The same conflict that erupted on the chalkstreams of England carried to the New World. And Americans in their way came to their own reckoning with the two philosophical approaches. Dry-fly fishing no more sprang from the mind of Halford than upstream casting from the pen of Stewart. Rather, a long and winding history prompted the overriding importance of the floating fly to the exclusion of all other methods. There was a long and developing history of the floating fly that led up to its ascendancy in the sport. 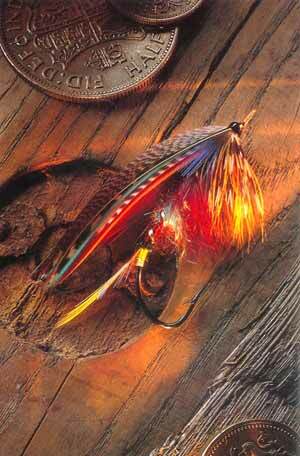 Certainly there were plenty of references to floating flies throughout the written past of fly fishing. Connection of tippet to hook was solved by a regular on the Itchen, Major W.G. Turle, whose knot provided a rigid connection to the fly and helped settle it on the water in the desired cocked position. From about 1840 on, flies were being fished dry all over the place. Over the southern Hampshire chalkstreams, the Itchen and the Test, the Devonshire Axe, Pulman’s home water, the Wye in Derbyshire and north to the Tweed in Scotland the dry fly flew. Before long it was the established method on southern chalkstreams, though it came to the Test a bit later than other rivers. By the 1860s, the dry-fly method was well established on the southern streams. From 1880 onward it was the only way to fish. One of the earliest chroniclers of the dry fly was Francis Francis — the same one who sideswiped the trout of Scotland and rose Stewart’s ire — who upon taking the helm as angling editor of The Field in 1857 reported the dry-fly method then beginning to capture the hearts and minds of the chalkstream crowd. But the champion above all champions of the floating fly was Halford. Frederick Halford’s first book, Floating Flies and How to Dress Them, appeared in 1886. In it he begins to chronicle the work of George Selwyn Marryat, who was regarded as the finest angler on the southern chalkstreams, and Henry Hall. Hall was an engineer who worked closely with Marryat and developed the process and metallurgy capable of producing the eyed, light-wire hooks appropriate to dressing the revolutionary dry flies that were developing. The development of the eyed hook was fairly important. No longer was a fly finished once its snelled gut wore out. The eye also afforded the angler with some choice in the size of tippet, making it possible to match different fishing conditions. Connection of tippet to hook was solved by a regular on the Itchen, Major W.G. Turle, whose knot provided a rigid connection to the fly and helped settle it on the water in the desired cocked position. Halford in concert with Marryat did a lot of work developing the fly that would ease the fishing on the difficult streams of the south where a gentle presentation was so critical. The hard-enamel-finish silk lines had supplanted horsehair by this time, but they too presented problems all their own. Stiffness, chipping, and lack of sensitivity and response were the biggest shortcomings. They did allow the angler latitude in casting direction but were nothing compared to the response and efficiency of oiled silk — especially an oiled silk line with a woven-in taper. Working together, Halford and Marryat developed the first tapered lines, forerunners of the modern double-tapers, and continued to improve the manufacture and production of silk lines for many years. Halford’s first two books (Dry-Fly Fishing in Theory and Practice came out in 1889) are considered his most valuable. The more he wrote, the more he became mean-spirited and intolerant of any but the most precise upstream imitative style of dry-fly fishing. Halford came to view all chalkstreams as distinctly dry-fly water. “If he is to be criticised it is because like most reformers he overstated his case. He considered that the dry fly had superseded for all time and in all places all other methods of fly fishing, and that those who thought otherwise were either ignorant or incompetent,” says Hills in his discussion of the dry fly, in A History of Fly Fishing for Trout. Before the end of his life, Halford had seen the development of the dry fly become a system, a method of fishing that spread around the world, wherever trout were found, and he’d had a lot to do with that distribution. Even on streams with their own dominant methods, it had become an option in the arsenal of trout fishermen. It had also become a religion in the south-country rivers where it was spawned. Halford was the link through which the dry fly came to America, too, through Theodore Gordon, about which more later. In spite of Halford’s pedantry, he changed fly fishing for the better. The changes wrought by his chronicling the work of Marryat brought some of the biggest changes of all time to fly fishing. And while the dogma of the dry fly was eventually to crack and allow a more diverse approach, a more reasonable, well-rounded angler to emerge, the development of dry-fly technique changed the face of angling forever, and it changed it for the better. With the full weight of the fishing world behind his dry­fly advocacy, it’s no surprise Halford felt like his tail had been badly twisted when a young upstart on the Itchen they shared devised a method of fishing different from his and published a book about it. Codified as it was, the dry-fly method had become one-dimensional. No longer did the method answer to specific problems that had once needed solving; rather, it extracted a slavish devotion from anglers. With its institutionalization, the upstream, imitative dry-fly method had developed to where it answered only its own demands for self-vilification. It was time for the sport to grow again, move beyond the gospel according to Halford. Skues published his Minor Tactics of the Chalk Stream in 1910, three years before Halford published his last book (The Dry-Fly Mans Handbook). In it he described what we know today as nymph fishing. Skues began his own brand of angling revolution as gently as can be imagined. He opens with ample credit to Halford, relating his early experiences with nymphing trout as though he chanced into the phenomenon purely by accident. As complimentary as he is of the dry-fly ideology, he plays it as though he were trying to be good but somehow the fates conspired against him to make him catch selective fish on a sunken fly instead. Skues would have us believe he was a determined dry-fly man who accidently on several occasions, several years apart, happened to catch fish with a dead-drifted sunken fly, when the only hatch-matching pattern left in his book proved to be dressed with low-grade hen hackle: unfloatable, though he might try to put it dry over a bulging fish. Shortly, though — in fact, by the time the first short chapter comes to an end and the second begins — we have Skues fishing and describing three stages of an aquatic insect hatch: The emergence of the nymphs, the dry-fly dun stage when trout feed on the surface, and the end of the hatch, when trout once again feed subsurface on the “broken submerged fly,” as he puts it. This last stage we know now as the stillborns, or perhaps the spinnerfall, which will be discovered again in the last half of the twentieth century. Though Hills ceases to be useful, it is big of him to acknowledge the limits of his own historical outline. Coming this far with him has been enjoyable and instructive. Skues had been fishing for well over 30 years, in the chalkstreams of England and throughout Europe, before he published Minor Tactics, so his studied informality and wonder at his pretended inadvertent discoveries must be seen as just that. Skues was far too bright and original a thinker otherwise to fool the reader for too long with his charade. His second book, The Way of a Trout with a Fly, offered an expansion on the earlier, broad strokes taken in Minor Tactics 11 years before. The later work is a thorough compendium of chalkstream methods, including wet flies, dry flies, and nymphs, all theory and technique polished and gleaming, presented within the easy familiar style that makes Skues so enjoyable even today. It’s hard not to quote Skues, as his lucid, fluid passages echo a sensitivity, clarity of thought, and Victorian elegance that are irresistible. Here’s an essential, however, on the frontispiece of The Way of a Trout with a Fly. By the time he published Nymph Fishing for Chalk Stream Trout, Skues had begun to take himself a bit too seriously. His earlier brilliance was tarnished in his last book, by his insistence on taking Halford to task on every point of disagreement. He cited chapter and verse, and carefully refuted each point — something that hardly needed to be done in 1932, when nymph fishing was well established and respected and Halford had been dead for a quarter century. This is too bad, for before he lapsed into this pettiness, excusable though it may be, Skues contributed a great deal of original thought and instruction to our sport. By his own admission, Skues felt that nymph fishing was simply another avenue to streamside success — not an exclusive approach, and it certainly required the accompaniment of good dry-fly technique. Skues was not without his own prejudices, however. The British insistence on fishing to feeding trout was extant in his writings, and he makes a point of explaining that he maintained strong principles when it came to fishing the water. It was essential, Skues maintained, to cast to feeding fish, the nymph or dry fly, whichever most closely matched what the fish were feeding on. Fishing the water was just not done. It would surface later, in America, where boorish practices went unrecognized. The vision of trout and the effect it has on the way in which they react to the fly and the angler; fly dressing; the importance of caddis hatches; the sinking and floating portions of the tippet — reading through Skues for the first time, if you have been fishing for any time at all, is like reading your most basic understandings of the sport reiterated from before the time you were born as an angler. Most of what we use is here. Many of the things we have discovered for ourselves we find Skues discovered before us. And of course, the same magic we find in modern nymph method held Skues in its grasp. His instructions for the use of a marrow spoon to extract the contents of a trout’s stomach and the inspection of said contents on a white china plate is an approach that would be with us for far too long into the twentieth century. It later reappeared as the trout stomach pump, which, while it yields sound information, is a bit intrusive to the minds of many anglers. It’s a personal issue — but Skues was right there on top of it in his last book. is just a single stanza of a poem that carries on like this for some eight double stanzas. The groundwork of nymph-fishing theory laid by Skues was built upon by many, but principal among them was Frank Sawyer, the riverkeeper on the Avon north of Salisbury. Sawyer was widely recognized in Europe for his expertise in fishing small nymphs. It was Charles Ritz, son of the famous Swiss hotelier, who brought him to the world’s attention — but we’ll be meeting Ritz later in this history, from the other side of the Atlantic. At this point it’s a bit overdue that we pay a visit to North America, where already the traditions of fishing a new continent are well under way. To get in on the beginning of this, we have to move back a few steps in time, as the British angling tradition through the Skues years overlaps a period during which fly fishing was going through its own changes in the United States. Far more important than a precise chronology of development is an understanding of the weft and weave of the fabric of tradition against which the excitement and adventure of North American fishing were played out. The British traditions were well established, and they were not without their own severe dogma. Many of the rules, especially the rules of the hallowed Hampshire waters, were not even a consideration to the Americans. The British tradition, where we leave it, made specific demands on the angler. Codes of conduct and expectations of behavior, concepts of propriety on the English chalkstreams are quite foreign to the American tradition. The British terminology “killing” a trout is not to be taken lightly It is generally accepted that once a trout is caught, it’s groceries. Return a trout to the river and it becomes a bottom­feeder. As such it’ll never be caught again, because anglers on these streams never fish on the bottom. Excerpted with permission from A Concise History of Fly Fishing by Glenn Law (Rainstone Press, 2015; all rights reserved).